This Mr Mills and his brother who used to repair antique furniture and had a shop in The Lanes. I lived with them for a short time at 31 Southdown Road, Portslade before joining the army. 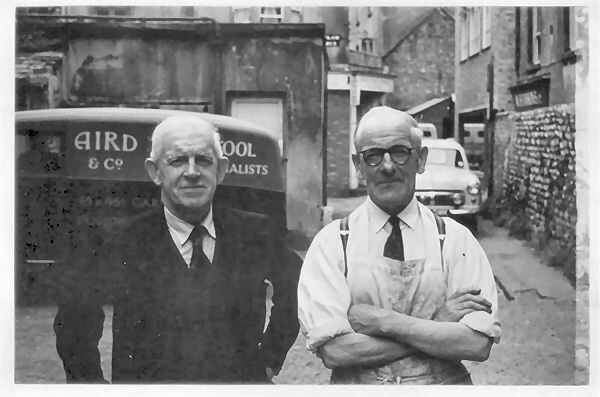 This is my Grandfather (on left) – I believe the family business was located in Clarence Yard (off Meeting House Lane) at that time. Would be most interested to find out more about the Mills’. My grandmother Mabel married a George Mills about 1927. A widow, she had two children Ronald and Clarice from a previous marriage. I think George died about 1946 but have no details of him except he had a wooden leg. Any info is greatly appreciated. The gentleman on the right about looks familiar from photos I have.